Adriana Montes, is a real estate broker/owner and director of REO and short sales at Florida Dreams Realty Group. A dedicated professional with a long tenure in the default sector that includes many years’ experience servicing and selling large volumes of distressed properties, She is well-known for performing beyond expectations and offering first-rate services to all her custome customers. A self-made business owner who immigrated to the U.S. at the age of eighteen and built a real estate empire, achieving her American Dream. A firm believer in education, she obtained a Bachelor’s degree in Finance and Marketing, a Master’s in Business Administration, and is in the process of completing a Juris Doctorate focusing on real estate and immigration law. 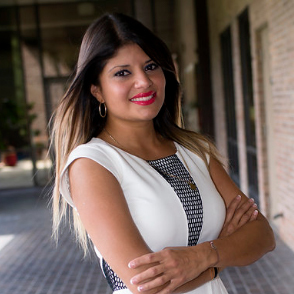 At only thirty years old, Adriana is the proud owner of Florida Dreams Realty Group, Inc., allowing her to employ several of her family members.” Featured in the 2015 Top 250 NAHREP Latino Agents. Adriana holds an MBA, specializing in Non-Profits. She is Luxury Home Specialist, a member of Five Star Federation of REO Certified Experts (FORCE), NRBA, NAHREP, NAREB and AREAA. Having grown up in the Florida area and obtaining my MBA from the University of Central Florida, She is very knowledgeable of our local housing markets and active in her area communities. Hands-on in every aspect of my full-service REO business, She works closely with owner-occupants and buyers to meet their needs. In addition to overseeing her REO brokerage firm, she hosts a twice-weekly radio program on AM 1270 Radio Luz to inform the community about the real estate market and related topics. Not only does the show give her unprecedented exposure to the Florida market but, more importantly, it provides an invaluable service to educate our community about local real estate. Like Adriana, her team of REO professionals is passionate about the work they do and are driven to offer superior services to our clients. A dynamic group of real estate experts, they are continuously looking for ways to be more educated and updated on current legislation to serve our sellers and buyers better. Aggressive and always at your service, everyone at Florida Dreams are committed to going the extra mile to earn a client’s business and dispose their assets in the least amount of time for the most amount of money. Whether you’re buying, selling, leasing, building, or managing real estate, Adriana and her team of experts can help.